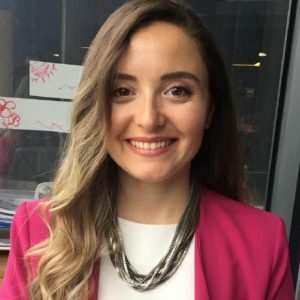 Merve Ayyüce Kızrak; In 2009, she completed her undergraduate degree at Haliç University, Electronics, and Communication Engineering Department. In 2011, she completed her postgraduate education in the Electronics and Communication Engineering program of the Haliç University, Institute of Science and Technology, and at the ITU Informatics Institute. She is currently a Ph.D. candidate at Yıldız Technical University, Institute of Science, Electronics, and Communication Engineering Program. She continues her academic, product development and consultancy work with various working groups. Technology Development Foundation of Turkey within the Ideaport is located in artificial intelligence working group throughout 2018, with 2019 as of March Ideaport is located in Orbit working group. She has started her academic career in 2009 in the Electronics and Communication Engineering Department of Halic University and continues her degree in Electrical and Electronics Engineering Department at Bahcesehir University in February 2019. Intelligent systems, operational intelligence, optimization, artificial neural networks, machine learning, deep learning (CNN, LSTM, GAN, RL, CapsNet) applying the methods and applications on various topics and develops new algorithms. She also likes to think and to read about Neuro-Cogn science. She is also a deep learning instructor with the “A-Z Deep Learning with Python“ course at Udemy. September 2017- March 2019 between voluntary work conducted by Turkey’s largest non-profit artificial intelligence community Deep Learning Turkey in the first year of institutions, Information and Communication Technologies Authority (ICTA-BTK) cooperation and Havelsan (Aviation Electronics Industry) support October 5-6, 2018, held in Ankara at ICTA she was Co-Chairwoman of the Regulatory Board of the DeepCon’18 Great Artificial Intelligence Conference.